The Edible Dormouse is Russian and extremely serious-minded. One of a small group of edible dormice residing in the UK, he is obsessed with answering the question, “Why are we here?” – both the philosophical question and the literal one. No answer satisfies him. So he has reached his own conclusion, and believes that he and his fellow edible dormice were planted in a small area of the Chilterns as SPIES and left there as a sleeper cell. Their job, until their proper purpose is revealed, is simply to gnaw at the infrastructure of the capitalist world. Many of his comrades have perished in daft accidents; he salutes their self-sacrifice. It doesn’t help that all his fellow dormice think he is mad. He eats some nuts and seeds, noisily. Makes satisfied noise. Forgive this. Edible dormouse must eat constantly. Nuts, fruits, little seeds. Nothing from conifers. Pah! But I forget, you will not know edible dormouse. No. Please, no interruption, my friend, you WILL NOT KNOW EDIBLE DORMOUSE. You see this large bushy tail and you think, perhaps, squirrel. You see plump little body and sweet little face, you think (not so sure) mm, overweight mousey-mousey? You see clever little hands and you think oh, squirrel again. Across whole landmass of Europe and former Soviet block, it is different story, however. (bitter) They see edible dormouse and they think, “Lunch.” “Trap this animal in jar immediately,” the say. “We eat it at our own convenience some time in the future.” It was Romans who decide we are edible. Oh yes. Our name in science is glis glis, named after the very pot the Romans used to keep us in. (suddenly fierce) I AM NOT MAKING THIS UP, this ghoulish detail. It is TRUE, my friend. Named after a pot! More than two thousand years ago, they noticed we got fat if we were fed in jars, and that we just went to sleep if nothing happening, which make us no trouble. Hence the name. Hence the shameful, humiliating name. Imagine how it feels to be one of the only zoological species in existence whose official name includes the word “edible”. Is there an “edible rabbit”? No. Is there an “edible sea bream?” IS THERE AN “EDIBLE CHICKEN”? No, there is no one else whose very name says, “Have you ever thought of eating me? I taste nice!” Oh, my friend, is it wonder that I, Sergei Sergeivich of Number Twenty-three, Beech Tree Crescent, in Amersham Area of Chilterns, search with such PASSION for deeper reason of existence? So I put things together. Forgive. (swallows) I say again, I put things together. I may be rare, cute-looking, and of indisputable foreign origin, but I am not stupid. What we do best, we “edible dormice”? Well, most of all we eat, we sleep. (ponders this) Oh yes, we sleep. Eight, nine months of the year, just dreaming sweetly of the Steppe. In my dreams, (proud) I am always in Russia – peasant music plays; the balalaika! – the vast magnificent flat expanse of sap green nature under a low golden sun. Not once have I dreamed of number 21 Beech Tree Crescent next door to the left, my friend. Not once have I dreamed of Number 25, next door to the right. Oleg no doubt dreams of both. But in my dreams, I do see what has happened here. I see again my brother Peter, who drowned in the water tank of this very loft; I see again my Uncle Ivanov, who gnawed through electrical cable to fridge downstairs and Pht! he was dead. I see the legendary Mikhail the Tailless, who was taken by an owl, and whose memorable and haunting last words, as he was being carried away in midday, were, (faintly) “Moscow, Moscow, Moscow!”. So many fallen comrades! Were these deaths without meaning? I refuse to believe this. I refuse to agree with fatty fatty Oleg. Each spring I wake and I am renewed in my conviction. (deep breath) We are Russian sleeper cell for whom Kremlin has special purpose. One day this purpose will be revealed, and I, Sergei Sergeivich of 23 Beech Tree Crescent, will be ready! The evidence is overwhelming. I say what we do – we eat, we sleep. This is true. What else we do? We use our teeth to destroy very foundations of capitalist edifice. We leave marks for each other – yellow marks even, like Moscow Rules!! We leave scent trails! We have code for contact each other; you hear our chirrups, what you think we are saying? You think we ask each other, (idiotic voice) “Er, is it still Sunday?” or “What time is Archers Omnibus?” No, we are saying, (efficient) “In position in third beech tree to the left; report coordinates, over.” Or (like a spy), “The Black Sea had bad storms this winter.” Why do we have these skills if not for spying on enemy of Soviet state? It is my belief that Mikhail the Tailless would have told us everything if that owl had not taken him. I never knew a more honourable and dignified edible dormouse. So brave to carry on after skin come off tail, leaving naked bone! So brave when whole tail then drop off completely! The people in this house, the “residents”, they have no idea we are here. True, they found electrocuted corpse of Uncle Ivanov in utility room, but they said “Squirrels!” and thought no more. By the time they wake up to us – well, everything will be chewed, everything gnawed, everything destroyed. Pipes, cables, wires, rafters, books, not to mention every tree in garden. All of us do this, even fatty Oleg, because it is our job. And yet we are protected species! If I were capable of laughing, it is at this hilarious state of affairs that I would laugh. But allow me to show you gnawing, as performed by professional. You pick up piece of essential electrical wiring, like this one here, above landing. Gripping it tightly in grippy-grippy paws, you place sharpy-sharpy teeth (as he demonstrates, it gets muffled) on wire casing. Then (gnawing noise, three lengthy bursts). There. Now. (he’s a bit puffed) You will observe I do not bite through wire itself. This is because I do not want to end up fried to crisp like Uncle Ivanov. But the sabotage is nevertheless complete. Just spot of water now on wire and Pht! All lights go out. They used to say jaw-jaw was better than war-war. Well, gnaw-gnaw beats both to a cocked hat! I heard little baby bat say to its babushka mummy, “Can I gnaw through cable, mummy?” And she said, “Whatever gave you that idea, my darlingest darling?” Well, it was I, Sergei Sergeivich, who gave him that idea. But it was wrong. Against nature. Baby bat is not enemy within, and will receive no glory when house collapses. Edible dormouse is enemy within, and all the triumph will be ours. Not all my comrades agree we have purpose that will one day be revealed. There is a story – which makes me very ANGRY – such crude counter-historical narratives make me so ANGRY – that we were brought to England by accident. By accident!! An animal-collecting aristocrat called (he spits at the name) Roth-es-child! – Lord Walter Roth-es–child! – brings edible dormouse to estate at Tring in 1902. Tring? TRING? Who can believe such details? No place on earth is called Tring. 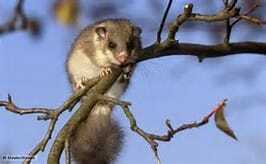 Then, story continues, edible dormouse breeds, escapes into woodland of the Chilterns but cannot go further than an area of fifty square kilometres because “suitable woods do not extend further”. Again, do they take us for fools, with this story? So edible dormouse lives on beech and spruce and larch and at 23 Beech Tree Crescent Amersham, all thanks to Edwardian aristocrat from TRING? What nonsense this story is! Yet comrades choose to believe it. When I tell them we were, on contrary, brought here by submarine in 1950s, and issued with instructions that have been tragically lost, they tell me I have gnawed my way through too many John le Carre novels for my own good. To me they say this. They dare to say this to ME. We will sleep again soon. We must fatten ourselves to get through the long winter ahead which might be cold by your standards, but, hey, you know, come on. We are made of sterner stuff, we edible dormice. Tonight is last meeting before hibernation, and I have made agenda. Fatty Oleg can just shut up and LISTEN. So. On agenda for implementation in spring: increase individual gnawing quotas; present weekly individual medal to incentivise group. Increase tracking practice; increase codes practice. Search methodically for missing orders, even if YOU DON’T BELIEVE THEY EVER EXISTED. But top of agenda: for pity’s sake, think of better name than “edible dormouse”. Because this can’t go on. Think of insurgent groups of past, such redolent names. Sandinista! Red Army! Khmer Rouge! International Brigades! Edible Dormouse! If we are to shape history here at 23 Beech Tree Crescent in Amersham Area we cannot do it bearing this scourge of a name. It is true, we look very cute: there is nothing we can do about that; we can use to our advantage. We are pests but we look like honey-honeys, we look like sweety-pies. Look at this tail, it’s gorgeous. But if we had a name more worthy of our dedication, our historical predicament! Okay. (big decision) Okay I will say it. I will tonight suggest that from now on we call ourselves … Lost Patrol. I know they will laugh, but I don’t care. Let them sleep on it. They will wake up understanding. (becomes very solemn) They will wake up no longer thinking of themselves as a Roman snack, kept in a pot until wanted, but as soldiers in a secret war. And each night, as a member of lost patrol goes to the edge of dark, dark forest and chirrups – and hears no answering chirrup in return – we will understand more deeply that lost patrol may be alone in Amersham area; alone and abandoned by retreating comrades; but our spirit will never fail while we have teeth in our heads, except perhaps for Oleg’s who is pathetic fatty fatty. Performed by Hugh Dennis for the series Rumblings from the Rafters, Radio 4.